Opened as "Bell Park Amphitheatre". Site of the annual Northern Lights Festival Boréal. 2001 renamed in honour of the Canadian politician and mayor of Sudbury, Grace Hartman (1900-1998). 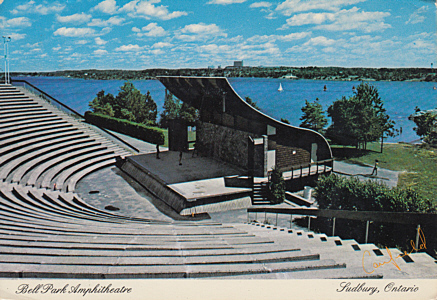 Front Text: "Bell Park Amphitheatre", "Sudbury, Ontario"
Reverse Text: "The Bell Park Amphitheatre. Ramsey Lake's lawned shore provides the setting for this magnificent open air theatre in Sudbury's Bell Park, Ontario, Canada."